Sustainability is now the prudent and responsible default option for everyday investors. Over 50,000 individuals like you have pledged to divest from fossil fuels and invest in climate solutions. Sustainability-focused investors now regard greenhouse gas emissions as the most important variable when it comes to climate impact. That’s why we’re enthusiastic supporters of the fossil fuel divestment movement. 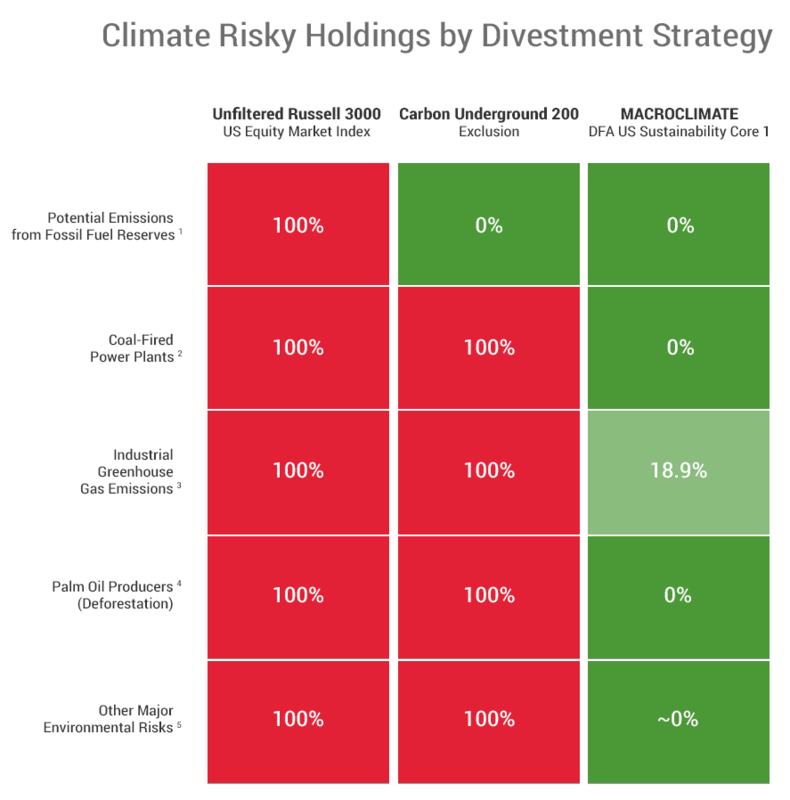 Divestment campaigns across the globe are using The Carbon Underground 200 as the definition for “fossil fuel companies” in their divestment ask. Like the Carbon Underground 200, our US and International Core Equity funds aim to reduce exposure to potential emissions from current fossil fuel reserves of the largest publicly-owned producers to zero. Palm oil production is the fastest growing cause of rainforest destruction today, and rainforest destruction is the second biggest driver of climate change after the burning of fossil fuels. That’s why we also exclude non-sustainable palm oil producers as recommended by Friends of the Earth. But we go further. Our US and International Core Equity funds exceed the standards of the divestment movement by excluding major owners of coal-fired power plants — the #1 problem, say climate experts — and substantially reducing exposure to industrial greenhouse gas emissions. We also exclude factory farming and companies in any industry deemed to have a particularly negative connection with land use and biodiversity, toxic spills and releases, operational waste, and water management. 1 Exposure to potential emissions from burning fossil fuels supplied by largest publicly-traded owners of such reserves per FOSSIL FREE FUNDS as of July 31, 2018. DFA US Sustainability Core Equity 1, DFA International Sustainability Core Equity, and DFA Emerging Markets Core Equity Portfolio serve as the foundation of Macroclimate® Ultra Low Carbon Global Equity Portfolio. 2 Exposure to MACROCLIMATE® 30 — the 30 largest public-company owners of coal power plants in Developed Markets plus China and India — as of July 2018. 3 Exposure to potential greenhouse gas emissions (Tons CO2e / millions sales) by publicly-traded companies. 4 Exposure to palm oil producers engaged in irresponsible and unethical practices per Friends of the Earth as reported by DEFORESTATION FREE FUNDS as of July 31, 2018. 5 Exposure to factory farming and publicly-traded companies in any industry deemed by MSCI to have a particularly negative connection — based on historical data — with land use and biodiversity, toxic spills and releases, operational waste, and water management. Targets are estimates based on simulated historical data. Filters were applied retroactively and with the benefit of hindsight. Such estimates represent targets — not an actual strategy. Sources: Macroclimate®, Dimensional Fund Advisors. Certain information incorporated herein has been provided by MSCI ESG Research Inc. Definitions of Fossil Free and Deforestation Free. And we don’t stop there. In addition to an exclusion strategy, we overweight the most sustainable companies while avoiding those that are average or below average. The consequence of this approach, at the industry level, is to shift capital from companies with the worst sustainability scores toward companies with the best scores.